On Tuesday I was instant messaging with a friend when I mentioned that I felt really anxious, as if an anxiety attack were imminent. I told her how I hated feeling like that, especially since I couldn’t identify the stressor that was causing the anxiety. All my articles were in, my taxes were done, and my bills were paid. She very kindly said, “Well…could it be that it’s, you know, April? And you have a bad day coming up?” I felt stupid for not realizing something so obvious, although it really shows just how much I have to compartmentalize that part of my life to function. Still, grief always finds a way to rear its ugly head. This week I’ve found myself drifting off. I’ve always been fairly easy to distract, but this week I’m doing dumb things like walking away from my car without turning off the engine (twice), or leaving my phone on a park bench (someone watched it until I came back). Normally I try to stay as busy as possible on this day, but I think my forgetfulness is a sign that I should stay in and lay low. This picture is the lock screen on my iPhone. We were in Arizona, on our annual Spring Training trip with Mike’s family. Mike and his dad, sister, and brother-in-law went to play tennis, but since it was hot I decided to take Maddie to the pool. I put her in this little polka dot bikini – one of my favorite things she owned – and used the camera on my computer to snap this picture. I love it so much. I remember how she splashed around in the pool, laughing and clinging onto me. I showed her how to kick her feet and told her she’d be taking swim lessons that summer. I can still feel the cool water and her skin against mine. I can’t wrap my mind around that picture being eight years old. I can’t wrap my mind around her being gone for eight years. I miss her in indescribable ways. I remember how much fun she had playing with her cousins Spencer and Danny, and I try to imagine her playing with Michaela and Liam. Strangely, I can let my mind picture that, but I rarely let myself think about what it would be like to see her with her sister and brother. It’s too painful. I try to treat today like any other day, but of course, it never will be. It’s the anniversary of the day I last held and kissed my baby. It’s the anniversary of the worst day of my life. And even though I have so many wonderful things to hold and kiss and love today, I will never, ever stop wishing for just one more day to hold and kiss her. I love you so much, Maddie. I miss you. Thinking of you all and sending love. Sending lots of hugs and love today for all of you. Her beautiful radiant smile! I wear purple today in her honor. May God bless the Spohr family today and every day. 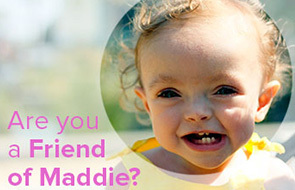 Mighty Maddie, love her beautiful smile. Hope your family feels lots of love today. So, so, so much love to you guys. Sending love to you and your family. I’m so sorry you can’t physically hug and kiss your sweet Maddie. Listen to your intuition and lay low and take care of yourself. Sending much love and peace to you and your family. Wow! This picture is beautiful. Big hugs and love to you all. What a great picture – I love her smile and the joy in her expression! Sending caring thoughts to you all today. I’ve been thinking of you and Mike all week. I found you right after Maddie passed and I’ve followed you ever since. Grief never lets go. I lost my mom when I was 13, I’m 36 now and I can tell you that whenever the anniversary of my mom’s death comes around I am an emotional mess. Reading your blog, going through your grief with my own has helped me in more ways than I will ever be able to express. Hugs to you and your family today and every day. I hope someone can help you as your words have helped me. Sending so much love and empathy to you and Mike. I hate that we both belong to this club. Hoping that you get through this day with the least sadness possible. I am so, so sorry for your loss and for your pain. I see such happiness in your face in this picture and my heart just breaks for you. So much love to you and your family. Maddie is such a light. Lots of light your way…..always and today. I started reading your blog shortly after you lost your beautiful daughter. Believe me, I think about her often, even though I never met her. I am so sorry that you can’t hold her anymore. I am so sorry, that she couldn’t have a lifetime with you. I was in tears when I read your post. I know grief myself. My heart was broken (and still is) because I lost a very important person in my life. But losing your child, I just cannot imagine. And I am just so sorry. I am happy that you have all the things in your life, that make you happy. And I wish Maddie would be with you too. Hugs to you and your whole family. Love to you and your family. I’ve been reading your blog for about nine years now and just realized I was wearing a purple shirt today. It wasn’t planned, but it seems like I’m always wearing purple when you write posts about Maddie. I can’t believe it’s been 8 years… I’ve been following you since that time.Do not underestimate how much Maddie smile soothe others’hearts as far as France. Sending lots of love and watching that star in the sky that is brighter than the others ? Sending love! Take care Heather. Sending big hugs to you Heather. I don’t comment too often, but today I want you to know that this stranger is thinking of you. I’m so sorry that you have to go through this. Thank you for sharing your family with all of us. 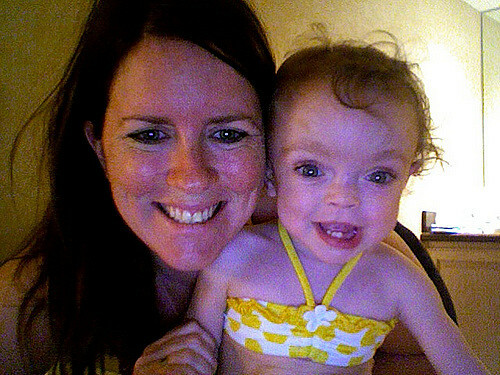 I love the picture of the two of you….such a beautiful mama and a precious little girl. I hope you can find some moments of peace in your heart. All the love to you. That is a great picture of you and Maddie. Hugs to you today. There are no words. I send you love and hugs and happy memories and it’ll never be enough but it’s something. I know that grief is not linear, but somehow it often manages to surprise me as well. And, going on six and a half years out from my daughter’s death, it also manifests itself in the same tricky ways for me–often anxiety and forgetfulness. It is oddly comforting to know I’m not the only one, and yet I wish so much that we were part of the majority who don’t know that gnawing, aching emptiness to hold a baby girl who isn’t here. Also, that bikini is ridiculously adorable and Maddie is so stinking cute. Sending love. That sweet Maddie face. ??? Thinking of you and Maddie today. Wishing you continued strength. Heather, there are no comforting words for this kind of incident, but I am going to say one thing that Maddie was very lucky to have you as her mom! She was loved and cared by you and your family everyday! Sometimes unfortunate things happen, so please don’t blame yourself at all! I followed your blog but wasn’t a mom yet when Maddie passed; I have a baby now and oh my God, the things I feel I didn’t know I could. it seems trite to say I’m thinking of you, but I am. and if I knew you I’d buy you a giant margarita and ask you to tell me stories about that beautiful little girl, and how you’re doing. Sending lots of love to you and your family. My heart aches for you, reading this. Such a beautiful picture. Lots of love to you and your family. What a beautiful picture. I found your blog just after Maddie died. My son was just stillborn, and I was in my own grief, searching for someone who I could relate too, even just a little. I have since had another son, who was a 3lb preemie and is now a mostly healthy 6 year old. I am sending my love to you and your family.